An exhibit of recent work by Le Moyne faculty members will open the 2015-16 season of exhibits at the Wilson Art Gallery in the Noreen Reale Falcone Library on the Le Moyne campus. 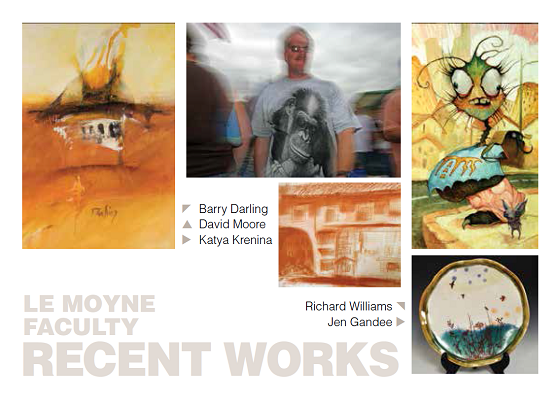 The exhibit features the work of Barry Darling, Jen Gandee, Katya Krenina, David Moore, and Richard Williams, all members of Le Moyne's visual and performing arts department. They work in a wide range of media and styles -- paintings, drawings, photography and sculpture; expressionism, symbolism, narrative, and realism. The exhibit opens on Friday, September 11, and will run through Friday, October 2, and can be seen during regular library hours. An opening reception will be held in the Wilson Art Gallery on Friday, September 11, from 4 - 6 p.m. The event is free and open to the public. For more information, call (315) 445-4153. Richard Williams is a professional illustrator and portrait artist with a Master of Fine Arts in Illustration from Syracuse University. His work is in the private collections of Steven Spielberg, George Lucas and Howard Stern.